PRODUCT DESCRIPTION: Aerosol which has a very low odor and is applied much the same way one sprays a can of hair spray. It used pyrethrin as the active ingredient which is a natural occurring insecticide extracted from the chrysanthemum flower. TARGET PESTS: Angoumois Grain Moths, Ants, Bedbugs, Booklice, Carpet Beetles, Centipedes, Chocolate Moths, Cigarette Beetles, Clothes Moths, Clover Mites, Cluster Flies, Cockroaches, Confused Flour Bee- tles, Crickets, Drug Store Beetles, Fleas, Flies, Fruit Flies, Gnats, Grain Mites, Granary Weevils, Horn Flies, House Flies, Indian Meal Moths, Mediterranean Flour Moths, Millipedes, Mosquitoes, Mud Daubers, Red Flour Beetles, Rice Weevils, Sawtoothed Grain Beetles, Silverfish, Small Flying Moths, Sowbugs, Spiders, Stable Flies, Ticks and Wasps. WHERE TO USE IT: Inside homes on carpeting, bedding, clothing, furniture and any place where target pests are hiding. RATE OF APPLICATION: A can will treat several rooms if you need to use it all at one time but the good thing about this product is that you control the spray. This means you can use it to treat small areas several different times. The main feature of this product is that it does not provide long lasting residual. Applications break down in hours and are gone so you will need to use it frequently to solve the problem. Is this spray good for lice to spray on helmets?? Its a great choice. 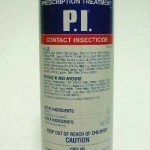 Quick acting and safe for use on items like helmets, PT-PI will do the job well for a wide range of pests including lice. Terrific with Gotcha Pro for high ceilings and outside walls.